Hands up anybody who has a rock solid faith with no doubts whatsoever? The chances are that only the very stupid or the delusional would put their hand up and keep it up for very long. Doubt is an ingredient of faith, it is how we grow as we question and search and seek to know more about God. We all know about the disciple Thomas, he was the one who doubted Jesus resurrection and we call him 'Doubting Thomas.' What a nickname, it could have been the source of all kinds of ridicule, but actually the story of how Thomas refused to believe that Jesus was risen from the dead is not recorded to make us mock Thomas. Rather it is there to remind us that Jesus works with us in our doubts and through this our faith can grow. Thomas goes on to call Jesus, 'my master and my God,' the first time that anybody in the Gospel of John does. His was a testimony which recognised more than anybody else who Jesus really was, God in human flesh. It is typical of us to remember the bad bits, that Thomas had difficulty believing. Thankfully God is not like that, he takes our weaknesses and turns them around. The struggling Thomas became the one who truly confessed Jesus. “Fellow Jews and all of you who live in Jerusalem, let me explain this to you; listen carefully to what I say. “Men of Israel, listen to this: Jesus of Nazareth was a man accredited by God to you by miracles, wonders and signs, which God did among you through him, as you yourselves know. This man was handed over to you by God's set purpose and foreknowledge; and you, with the help of wicked men, put him to death by nailing him to the cross. But God raised him from the dead, freeing him from the agony of death, because it was impossible for death to keep its hold on him. David said about him: “ ‘I saw the Lord always before me. Because he is at my right hand, I will not be shaken. Therefore my heart is glad and my tongue rejoices; my body also will live in hope, because you will not abandon me to the grave, nor will you let your Holy One see decay. You have made known to me the paths of life; you will fill me with joy in your presence.’ “Brothers, I can tell you confidently that the patriarch David died and was buried, and his tomb is here to this day. But he was a prophet and knew that God had promised him on oath that he would place one of his descendants on his throne. Seeing what was ahead, he spoke of the resurrection of the Christ that he was not abandoned to the grave, nor did his body see decay. God has raised this Jesus to life, and we are all witnesses of the fact. Praise be to the God and Father of our Lord Jesus Christ! In his great mercy he has given us new birth into a living hope through the resurrection of Jesus Christ from the dead, and into an inheritance that can never perish, spoil or fade–kept in heaven for you, who through faith are shielded by God's power until the coming of the salvation that is ready to be revealed in the last time. In this you greatly rejoice, though now for a little while you may have had to suffer grief in all kinds of trials. These have come so that your faith–of greater worth than gold, which perishes even though refined by fire–may be proved genuine and may result in praise, glory and honour when Jesus Christ is revealed. Though you have not seen him, you love him; and even though you do not see him now, you believe in him and are filled with an inexpressible and glorious joy, for you are receiving the goal of your faith, the salvation of your souls. On the evening of that first day of the week, when the disciples were together, with the doors locked for fear of the Jews, Jesus came and stood among them and said, “Peace be with you!” After he said this, he showed them his hands and side. The disciples were overjoyed when they saw the Lord. Again Jesus said, “Peace be with you! As the Father has sent me, I am sending you.” And with that he breathed on them and said, “Receive the Holy Spirit. If you forgive anyone his sins, they are forgiven; if you do not forgive them, they are not forgiven.” Now Thomas (called Didymus), one of the Twelve, was not with the disciples when Jesus came. So the other disciples told him, “We have seen the Lord!” But he said to them, “Unless I see the nail marks in his hands and put my finger where the nails were, and put my hand into his side, I will not believe it.” A week later his disciples were in the house again, and Thomas was with them. Though the doors were locked, Jesus came and stood among them and said, “Peace be with you!” Then he said to Thomas, “Put your finger here; see my hands. Reach out your hand and put it into my side. 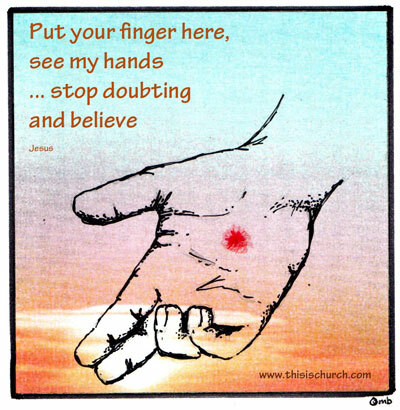 Stop doubting and believe.” Thomas said to him, “My Lord and my God!” Then Jesus told him, “Because you have seen me, you have believed; blessed are those who have not seen and yet have believed.” Jesus did many other miraculous signs in the presence of his disciples, which are not recorded in this book. But these are written that you may believe that Jesus is the Christ, the Son of God, and that by believing you may have life in his name. si gustastis quoniam dulcis Dominus. However today is anything but an anti-climax, for we read of the visit of the risen Lord Jesus to his disciples and we hear words of comfort, encouragement and commission. Reading the passage in John today it is clear that there are reasons for concern among the disciples. They had seen Jesus killed in a most brutal and unjust fashion. The powers of the mighty Roman state had combined with the Jewish religious leaders in an unholy and unjust alliance. With corrupt authorities acting in such a way nobody was safe. We see this all over the world still today, when the established powers of the state have gone bad, then nobody is safe and individuals feel themselves to be powerless victims, vulnerable with no appeal to a higher authority. As well as the obvious fear, the disciples were also bewildered. They had not joined up the dots to reveal who Jesus was, the events were still a confusing puzzle. Mary had reported seeing an empty tomb and Peter and others had found the grave cloths. Later Mary had claimed to have actually seen Jesus alive, but why was it that she failed to recognise him until he spoke her name, why had he seemed to her like the gardener? So it was that as some of them gathered in the evening, they made sure that the door behind them was securely locked. We would all have done the same, terrified that the next knock might be from another groups of soldiers sent by Jewish authorities. The future was frightening, who might be arrested and killed next? Even if Jesus had been raised from the dead what did this mean? Was Jesus a ghost? Why had he come back? Was Jesus going to punish them for having denied him and abandoned him in his hour of need? Little wonder then that when the risen body of Jesus appears in their midst in spite of closed doors, the first words which Jesus utters are 'peace be with you' or in Hebrew ‘Salom alekem’. ‘Shalom’ as we say, was a common greeting and yet in this case it is now a supreme greeting and it is seen used as a greeting in every epistle of Paul in the New Testament. Jesus is shown to say theses words three times in this passage, twice on this first appearance and one a week later when the disciples are again meeting behind locked doors and Jesus make a reappearance for the sake of Thomas. On both visits Jesus shows his wounded hands and his side. The disciples have no doubt that this is the crucified Jesus and they respond with joy! Not sufficient joy to enable them to overcome their fear and stop locking the doors behind them, but nevertheless the response to the presence of Jesus is one not of fear but relief, thanksgiving and happiness. We would all have acted like the disciples, locked ourselves away in fear behind closed doors and refused to believe Jesus unless we saw him for ourselves. We would have had a complete lack of confidence and be full of guilt at what we had done in letting Jesus down. In some ways not a lot has changed and this often the situation in which we find ourselves today. As a Church we can be fearful of events taking place around us which knock our confidence and cause us to lose faith and trust in God, perhaps event to question whether God is really there at all, or whether we are all just making it up. We might be like those first disciples and be paralysed by a sense of our own failure and inadequacy. Yet we see that it is to such people that Jesus entrusts his work. Jesus does not ask for superficiality and pretence, he meets us in our doubts and difficulties and encourages us to move forward with him. I don’t know about you but I have much higher regard for somebody who struggles with their faith and is aware of their own inadequacies than somebody who thinks they know it all and so sure of themselves. Remember the servants of God who with their honesty were conscious of their own inadequacies which s seem a prerequisite for those whose seek to serve God. Think of Moses, I cannot do this God, I cannot speak. Think of Jeremiah, struggling with deep depression, in that deep dark pit of despair which is only known by those who have been in it. Think of Peter who had a life which seemed characterised by dreadful times of failure, which led him to deny Jesus three times. God of the prophets, you fulfilled your promise that Christ would suffer and rise to glory. Open our minds to understand the scriptures that we may be his witnesses to the ends of the earth. We ask this through Jesus Christ our Lord, who is alive and reigns with you, in the unity, of the Holy Spirit, one God, world without end. Amen. The passages of the Acts of the Apostles are full of good news about what happened following the preaching and teaching of the Apostles. If we were to continue the first reading from today we would find the words ‘Those who accepted his message were baptized, and about three thousand were added to their number that day.’ What preacher would not read those words with envy and perhaps be disillusioned that today it is difficult to break through the complacency which is so prevalent. Yet we should take heart, it was not all easy and plain sailing. The disciples themselves found belief hard. We should be encouraged because Jesus knows that belief is not easy. However we do not believe without reward, as we trust in the risen Christ, so we are blessed, - belief has its rewards. Perhaps one of the lessons which we as a church need to receive, concerns how the early Christians treated those who found belief difficult. Struggling with doubt was not a reason to be thrown out. When Jesus appeared, Thomas was with the disciples behind locked doors. He had not been thrown out of the church because he wavered. The early Christians were confident enough in what they believed that they were not threatened by those whose faith was weak and uncertain. The church today must equally embrace those who have doubts and difficulties with their faith. There may be many reasons why we find faith hard at different times of life. Sometimes it is personal tragedy, although more often Christians find their faith to be even more assured in times of difficulty. Whatever the cause, a strong church must welcome within it those who seek the presence of the risen Lord. In the Gospel reading this morning we are confronted with the issue of faith. Thomas had a problem believing his fellow disciples when they said that Jesus had appeared to them in a locked room. In fairly forceful terms, Thomas said that unless he could see it for himself he wasn't going to believe a word of it. Thomas is the forerunner of all good scientists who have to prove things for themselves in order to believe them. But Thomas did us all a favour because he asks the questions we might want to ask. Was the Risen Jesus a ghost, or perhaps a fantasy conjured up by the people that missed Jesus so much that they imagined they saw him? No, because Thomas proved that Jesus was a physical person with a wound in his side. He had a nasty squashy hole in him, which could be touched. Now we don't know how, but we know from the example of Lazarus that Jesus could do such things. Jesus could overcome the laws of the physical universe as we now understand them. Humans, in our arrogance, assume that the truth as we know it is the only truth and the only answer. Technologically advanced as we are, we know so little about the things that matter. Religious belief belongs to a category of knowledge which is difficult to measure or touch. It isn't susceptible to concrete proofs. The children will be helping us this morning with experiments. How do you know that the wind is there, you can't see it, smell it or taste it? You can't hold it in your hand, but you can feel it on your skin or watch it move things. We can't see the wind itself, but we can see what it does. Faith is like that. In the same way as we can infer the presence of the wind by its action of the wind on a balloon, we can see the impact of faith on the lives of those who are blessed with it. 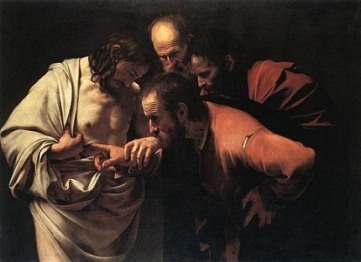 Church tradition suggests that Thomas was profoundly affected by his experience of seeing and touching the Risen Lord. It is thought that he went off to tell the story of Jesus to the people of ancient Babylon, near the Tigris and Euphrates Rivers, where Iraq is today. He travelled to Persia, present-day Iran, and continued to win disciples to the Christian faith. Tradition suggests that he sailed south to Malabar on the west coast of India in 52 AD. He preached, established churches, and won to Christ high caste Brahmins, as well as others. When the Portuguese landed in India in the early 1600s, they founded a group of Christians there -- the Mar Thoma Church established through Thomas' preaching a millennium and a half before. As newborn babes, alleluia, desire the rational milk without guile, alleluia, alleluia, alleluia. Rejoice to God our helper. Sing aloud to the God of Jacob. In the first row, and among those who were most bent over the bed, four were noticeable, who, from their gray cagoule, a sort of cassock, were recognizable as attached to some devout sisterhood. I do not see why history has not transmitted to posterity the names of these four discreet and venerable damsels. They were Agnes la Herme, Jehanne de la Tarme, Henriette la Gaultière, Gauchère la Violette, all four widows, all four dames of the Chapel Etienne Haudry, who had quitted their house with the permission of their mistress, and in conformity with the statutes of Pierre d'Ailly, in order to come and hear the sermon. What is this, sister? said Agnes to Gauchre, gazing at the little creature exposed, which was screaming and writhing on the wooden bed, terrified by so many glances. "What is to become of us," said Jehanne, "if that is the way children are made now?" "I'm not learned in the matter of children," resumed Agnes, "but it must be a sin to look at this one." "Sixteen years previous to the epoch when this story takes place, one fine morning, on Quasimodo Sunday, a living creature had been deposited, after mass, in the church of Notre- Dame, on the wooden bed securely fixed in the vestibule on the left, opposite that great image of Saint Christopher, which the figure of Messire Antoine des Essarts, chevalier, carved in stone, had been gazing at on his knees since 1413, when they took it into their heads to overthrow the saint and the faithful follower. Upon this bed of wood it was customary to expose foundlings for public charity. Whoever cared to take them did so. In front of the wooden bed was a copper basin for alms. The sort of living being which lay upon that plank on the morning of Quasimodo, in the year of the Lord, 1467, appeared to excite to a high degree, the curiosity of the numerous group which had congregated about the wooden bed."